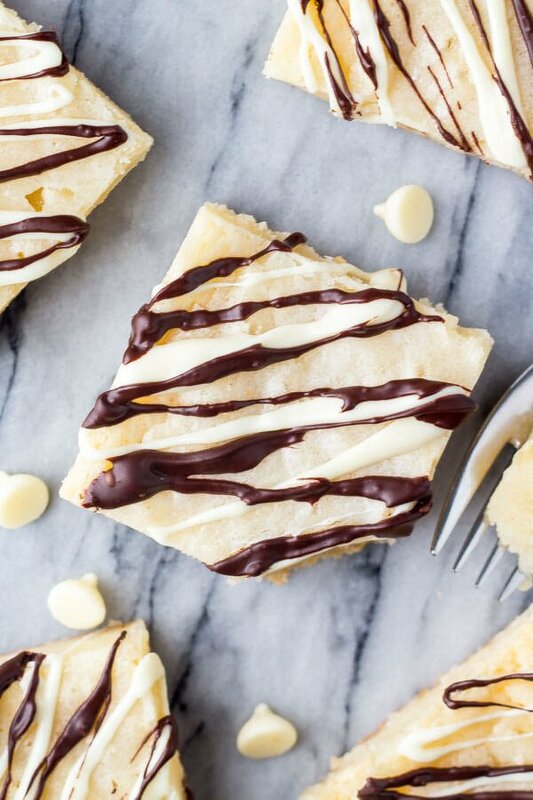 These white chocolate brownies are probably the ultimate dessert if you love white chocolate. 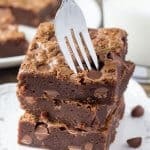 They’re fudgy, gooey and like biting into a piece of white chocolate in brownie form. You see – I’m a bit of a brownie aficionado. A brownie enthusiast if you will. Nutella Brownies, Frosted Brownies, Brownie Pie… I’d take a fudgy brownie over cake any day. So when I started daydreaming about white chocolate – making gooey white chocolate brownies seemed like the perfect idea. Especially when you’re craving brownies, but want something a little out of the box. The white chocolate flavor is really the star of the show. But it’s the fudgy texture that make these extra delicious. 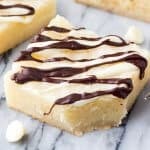 What Makes these White Chocolate Brownies so Delicious? We’re using melted butter & melted white chocolate. Compared to brownies made with cocoa powder, brownies made with melted chocolate are fudgier. Plus, white chocolate is delicious. There’s no electric mixer here. Electric mixers add air to the batter which creates a lighter, fluffier texture. Since we want dense, chewy brownies, we’re skipping the electric mixer. You’ll notice there’s no baking powder or baking soda in the recipe. Baking powder and baking soda create lift and rise in our baked goods because they release tiny air bubbles as things bake. So by leaving them out, our brownies are fudgier and denser. Finally, be careful not to over bake your brownies. The difference between a couple minutes means fudgy brownies or dry brownies. Bake for about 25 minutes depending on your oven, and when they’re done the top should look set and the sides are just starting to pull away from the edges. If you insert a toothpick into the middle of the pan, it should come out dry or with a few dense crumbs. Now the only real “trick” to making these white chocolate brownies is to be very careful when melting the white chocolate and butter. White chocolate bakes very easily when you try to melt it, so work in short bursts microwaving it for 20 seconds at a time, then removing the bowl from the microwave and stirring. The hardest part of this recipe is actually waiting for the brownies to cool fully before cutting into them. Since they’re so fudgy, if you try to cut them right away you’ll have a big mess. Plus – the flavor actually intensifies over time. 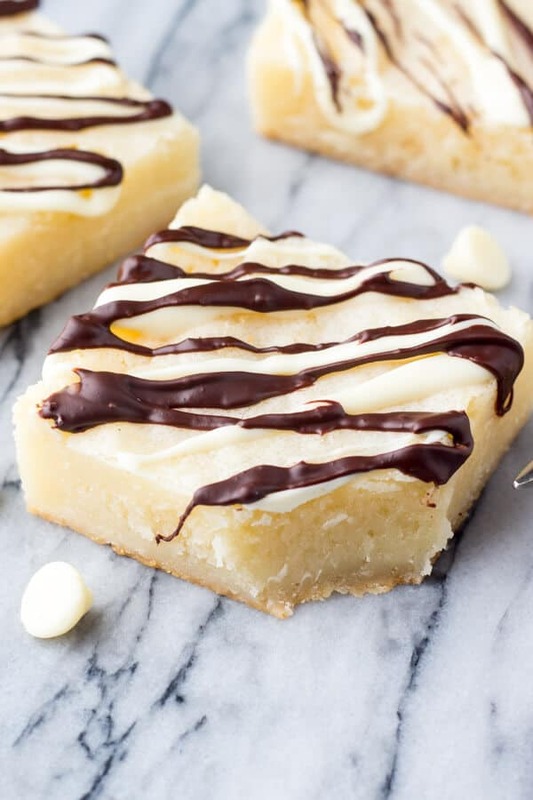 After the white chocolate brownies are cooled, you can cut them into squares and drizzle with more chocolate. I love the drizzled chocolate on top because it gives a super pretty zebra-esque stripe. And I’m ALWAYS a supporter of more chocolate. Fudgy, gooey white chocolate brownies are heaven in brownie form. These are made in one bowl, and the flavor actually improves after they cool down. 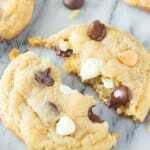 If you love white chocolate, these are for you! Line an 8x8 inch baking pan with aluminium foil & spray with non-stick cooking spray and set aside. In a medium sized microwave-safe bowl, melt the butter and white chocolate in short 20 second bursts. Stir after each 20 second burst. After both the butter and white chocolate are melted, cool for 5 minutes. Whisk in the granulated sugar, followed by the vanilla, eggs and salt. Pour/spoon the mixture into your prepared pan and bake for 20-24 minutes, or until the top is set and the sides are starting to pull away from the pan. An inserted toothpick should come out with a few moist crumbs, or clean. Allow the brownies to cool fully in their pan. To serve, lift the brownies out of the pan using the aluminium foil edges. Carefully peel back the sides of the foil, then cut into 9 or 12 squares. In a small bowl, melt the white chocolate chips in the microwave in short 20 second bursts, stirring between each burst. 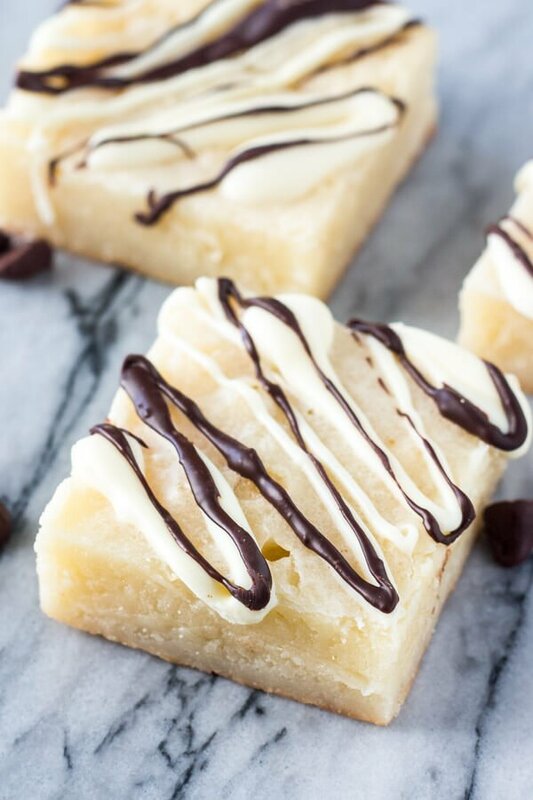 Drizzle the white chocolate over each square. Repeat the process with the semi-sweet chocolate chips. Brownies can be stored in an air-tight container in the fridge for 4-5 days. Oh my lanta. These look absolutely divine! One of the few white chocolate desserts to ever make me drool like this! I love white chocolate and these looked so unique I had to try them! They were delicious, fudgy, and just the right amount of sweet! This white chocolate brownie recipe is the absolute best brownie I’ve ever made and tasted. Absolute perfection!! So fudgy good, the perfect consistency. Try them; you’ll love them. Absolutely wonderful; a must make! Turned out perfect. I’m going to try there’s but would also like to try alil cakey type of brownie.